You can run from your past but you can never hide from yourself…. When John Callum arrives on the wild and desolate Faroe Islands, he vows to sever all ties with his previous life. He desperately wants to make a new start, and is surprised by how quickly he is welcomed into the close-knit community. But still, the terrifying, debilitating nightmares just won't stop. Then the solitude is shattered by an almost unheard of crime on the islands: murder. A specialist team of detectives arrives from Denmark to help the local police, who seem completely ill-equipped for an investigation of this scale. But as tensions rise, and the community closes ranks to protect its own, John has to watch his back. But far more disquieting than that, John's nightmares have taken an even more disturbing turn, and he can't be certain about the one thing he needs to know above all else. Whether he is the killer…. This is a very interior novel. It has some lovely literary elements to it and I did enjoy it. The atmosphere is seductive and gripping, and the character is nicely developed. However, I found the narration hard to cope with. The Scottish brogue is thick and unremitting and, to my ears, somewhat artificial. Reynolds does Irish and Northern English accents very well, but his Scottish burr leaves something to be desired. I suggest you listen to the audio sample provided to see if it works for you. 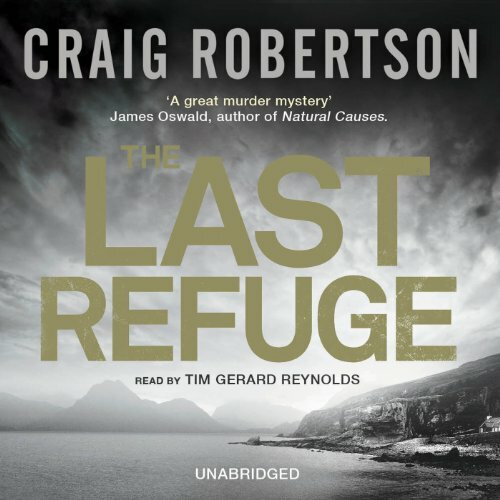 Would you consider the audio edition of The Last Refuge to be better than the print version? I didn't read print version. Would you be willing to try another book from Craig Robertson? Why or why not? Maybe. It would have to catch my attention to start. The author has a good telling ability but very long-winded in parts and it made me lose attention. I almost gave up after the first hour of listening because there were so many non-necessary details. Once we finally got to the story it was much better. Pretty adept at changing his voice to meet the character accents. Usually good...sometimes annoying and he slips in and out occasionally. What would you NOT do for love? I rralky enjoyed the first half of this book: scenery descruption, character introduction, the murder victim- who seemed a satisfactory killee. But from there, the the book unravels er... crashes.. If you are after a good mystery, this isnt it. if you like a n interesting read - for half a book, this is OK.